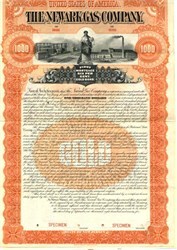 Beautifully engraved RARE Specimen Gold Bond Certificate from the Newark Gas Company dated 1895. This historic document was printed by the American Banknote Company and has an ornate border around it with a vignette of an allegorical woman between manufacturing scenes. This item is over 124 years old. 50 coupons attached on top, not shown in scan. This is the first time we have had this bond for sale. Certificate The Consolidated Gas Company of Newark was formed in 1898, by a consolidation of the Newark Gas Company, Newark, N. J.; the Montclair Gas and Water Company, Montclair, N. J.; the Summit Gas Company, Summit, N. J.; and the Peoples' Gas Company, Irvington, N. J. The entire capital stocks of the East Newark Gas Company and the Orange Gas Company were owned by the Newark Gas Company, and therefore passed to the control of the new corporation. On December 1, 1898, the Consolidated Gas Company of Newark was leased for 999 years to The United Gas Improvement Company. The Essex and Hudson Gas Company then assumed all rights and liabilities of the lease. The United Company, however, agreed to be directly responsible for the first 6 years for all payments required by the contract.